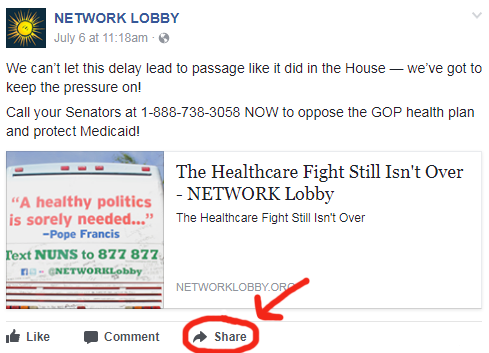 Your presence on social media can be a powerful tool for educating, organizing, and lobbying to Mend the Gaps. Millions of people use sites like Facebook and Twitter every day to track news, updates on the Hill, and for advocacy purposes. We at NETWORK mainly use our Facebook account for longer posts and Twitter for quick updates, YouTube for videos and Flickr to share images. 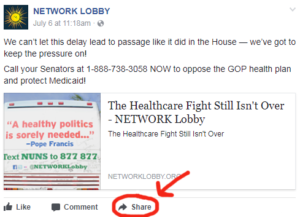 Facebook and Twitter can be good places to share your beliefs about policy, advocate for policies that mend the gaps, and engage with other NETWORK members. With so many people following conversations on social media, there are many opportunities to have your message heard. Even members of Congress listen to what their constituents say on social media! Navigating social media as a beginner can be overwhelming. Consider using video tutorials as you set up your social media accounts and begin sharing. Here are links to long and short Facebook tutorials and long and short Twitter tutorials. Your unique individual or organizational perspective is unique and important – use that to your advantage! NETWORK keeps a very active social media presence on multiple platforms. Consider following us on social media to share content that resonates with you and to get ideas on how to get involved in the conversation.